first regularly scheduled service from the Netherlands to the Netherlands East Indies. The postal card actually originated on October 15 in another location in Java as evidenced by the two CDS. The originating post office appears to be WELTEVREDEN (see also the return address at lower left). All the Dutch names in Java disappeared with Indonesian independence. The sender designated service Per Vliegtuig Ned. Indië - Nederland. The Netherlands regular air service to the far east had begun on October 1, 1927. Captain Koppen took off from Schiphol/Holland airport bound for the Netherlands East Indies. The aircraft, shown above, was a three engine Fokker F-VIIb, H-NAEA (registration number), Postduif (carrier pigeon). transoceanic flights of that era and was not completed until October 10. The return flight took off on October 17 after a week's layover in Batavia. Special departure postmarks were applied at Batavia, Muntok, and Palembang. The crisp 17 OCT. 27 example here is for Batavia. 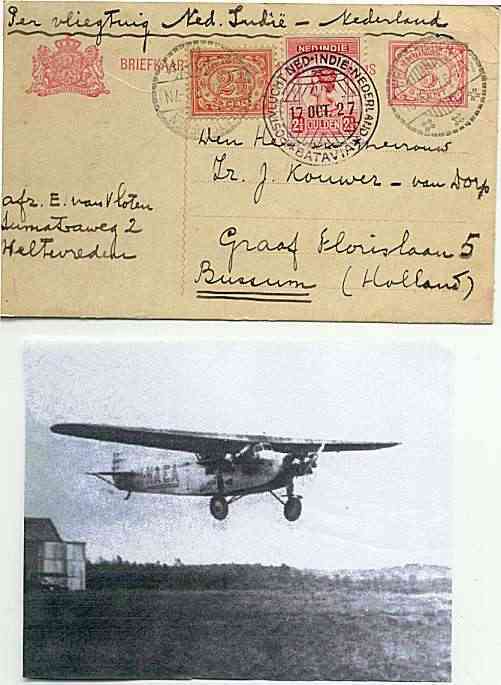 The return flight arrived in Amsterdam on October 28, 1927. The card was then forwarded to its destination of Bussum about 20 km southeast of Amsterdam. (Scott 106) has been added to make up the rate for ordinary ground service. The flight required an additional air fee of 10 Gulden for letters up to 20 gr and 2½ Gulden for postcards. of 1913 (Scott 136 - there are perforation varieties). *Thanks to Guillame for confirming the status of Weltevreden, the translation and for correcting my typos.